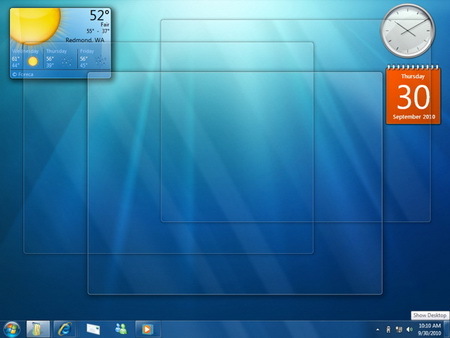 Aero Peek is a Windows 7 feature that let you peek past all your open windows straight to the Windows 7 desktop. To try aero peek, simply point your mouse to the right edge of the taskbar and watch open windows instantly turn transparent, revealing all your hidden icons and gadgets. To adjust the display speed, you need to do a manual hack on a registry entry. 1. Open regedit.exe from Run dialog box. 3. Edit the value of key named as DesktopLivePreviewHoverTime (create a new DWORD if it does not exist). The key's value is in milliseconds, for example 1 second = 1000 and so on. The default value is set to 500, or half a second. If you want to do it automatically, you can also download the aero peek registry hack here.